This year the Shaw Festival has revived its highly successful production of Noel Coward's 1925 play "Easy Virtue". Last year the Shaw did what they are so good at--taking a lesser-known work, pulling out all the stops on a production to show its full merits and, in this case, proving that the work has been unjustly neglected. This year they have topped themselves by improving an already excellent production. I now cannot imagine a better production of this play anywhere in the world. The play concerns the upper middle-class Whittaker family whose ordinary habits and whose conventional views are upset when Colonel Whittaker's only son John brings home his new wife Larita, whom he has married on the Continent and about whom the family know nothing except what their own prejudice makes them imagine. As a result, when Larita does appear at the family’s country home, the Whittaker women continue to see only the loose woman they imagine a continental divorcée to be and make no attempt to her as she actually is. Only the Colonel, who has strayed from the straight and narrow in the past, John's ex-fiancée Sarah and her friend Charles, show the slightest understanding for Larita's plight in having to live in circumstances so unlike what she is used to and in having to deal with the increasing lack of interest from her husband. Events reach a climax when a news clipping of an past scandal is found and the hostility of the Whittaker women for Larita flares into the open. Superficially, the target of Coward's satire is narrow-mindedness of the English middle class, completely convinced that its tidy view of the world is the only valid one. 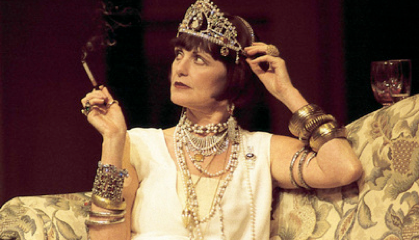 Most of the humour of the play derives from Coward's exposure via Larita of the Whittakers’ limitations and hypocrisy. On a more general level, however, the play is about how everyone is more willing to accept illusion rather than reality to get through life. This helps explain how Larita and John Whittaker came to fall in love at all. When the disillusionment comes, it is not comic at all. Those who think of Coward as writing only frothy comedies will be surprised at how serious and even tragic the undertone is to this play. There have been two significant changes in the cast from last year--in both cases for the better. Ben Carlson plays John Whittaker, the role played by Kevin Bundy last year. Although John is supposed to be young and weak, Carlson has the stage presence necessary to convince us why Larita would ever be attracted to him. This year Patrick R. Brown plays Charles Burleigh, the role played by Todd Waite last year. Waite made Charles a generally good-hearted kind of fellow, but Brown, in a very different interpretation, immediately establishes his sympathy with Larita to the point where his character becomes a kind of stand-in for Coward himself, foreseeing and commenting on the course of the action. What was merely a minor character has now become a focus for our understanding. The rest of the cast is uniformly excellent, giving performances even more richly nuanced than last year. Patricia Hamilton plays Mrs. Whittaker as barely able to conceal the loathing she feels for a person who challenges her black-and-white assumptions about the world. Kelli Fox shows Marion Whittaker as taking after her mother, having repressed thwarted love into a kind of religious zeal for the “truth”, which ultimately she cannot face. Fiona Byrne as the younger sister Hilda shows how easily youthful infatuation can flip into hatred. David Schurmann as Colonel Whittaker has retreated from his family and all but given up trying to fight their misplaced moral indignation only to be to drawn out of isolation by his sympathy for Larita. Glynnis Ranney masters the difficult role of John's ex-fiancée who knows his faults, still loves him, but still identifies with the woman he is wronging. Central to the whole play, of course, is the character of Larita. In this role Goldie Semple gives one of her best ever performances. She makes Larita an extraordinarily complex character whose boredom in the Whittaker home she knows is only a sign of a deeper dissatisfaction with love and perhaps with life. She has a wit and perception of irony that she turns on others as well as herself and has no patience with people who cannot recognize the complexity of living. She is also has the courage to commit a kind of social suicide when she knows the time has come for it. The play is acted out on William Schmuck's gorgeously detailed set and in his witty costumes, ranging from the frumpy outfits of Marion to the sophisticated asymmetry of Larita’s. All is beautifully lit by Alan Brodie, especially in the rainstorm that begins the play and in the party scene that ends it. Christopher Newton’s masterful direction is even more finely detailed than last year, drawing as much from what the characters don’t say as from what they do. He seems to have rethought the play to bring out the darker tone beneath the surface of laughter. Last year it seemed Larita was trying to make an effort to fit in only to see the futility of it. This time it is clear from her first entrance that she knows her marriage to John is a mistake and that, in entering the Whittaker home, she has stepped into a trap. Newton makes the ending which leaves the revellers oblivious to personal tragedy and the Whittakers unchanged the most powerful condemnation of their world. Photo: Goldie Semple as Larita. ©2000 Shaw Festival.